Today is Gold Star Spouses Day, a time to honor the husbands and wives of fallen servicemembers who take up the courageous task to keep their loved ones’ memories alive. As we thank them for their service and sacrifice on this #GoldStarSpousesDay, there are several ways to honor fallen heroes of our country and celebrate those loved ones they leave behind. One way to honor those nurses who paid the ultimate sacrifice in service to their country is through recently introduced legislation. The bi-partisan United States Cadet Nurse Corps Service Recognition Act (H.R. 2056/S. 997) was recently introduced in both houses of Congress by Congresswoman Cheri Bustos (D-IL), Congressman Greg Gianforte (R-MT), Senator Elizabeth Warren (D-MA) and Senator Susan Collins (R-ME). The U.S. Cadet Nurse Corps served in World War II and are the only uniformed corps members from that war who haven’t been recognized as veterans. The United States Cadet Nurse Corps Service Recognition Act would correct this and ensure that these nurses’ service to their country is never forgotten. This remarkable group of nurses didn’t just make a difference by serving – they revolutionized the nursing profession for decades to come. 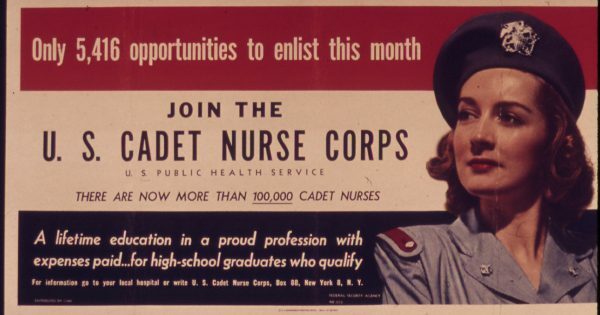 By ensuring that there were trained healthcare professionals at home and abroad during World War II, the Cadet Nurse Corps paved the way for how nursing and nurse training evolved in the US by professionalizing the practice and teaching methods that would serve as the backbone of our nation’s recovery for generations. As a result of federal funding for the program, nursing schools across the country were able to upgrade their facilities and equipment, ensuring better care for all patients, not just those serving in the military. The program also made positive steps toward expanding access to minority and low-income students who might not have considered entering the profession otherwise. In honor of #GoldStarSpousesDay, we’re asking you to take action and tell your Member of Congress to not only support these bills, but to ensure passage. This common-sense legislation has been introduced 11 times, but has yet to become law. As we commemorate #GoldStarSpousesDay, it is long overdue that these brave Nurses who served our nation with dignity in its time of need are properly recognized as veterans.